After all our light play activities, we thought we would take you to a whole new place..... the dark. Break open the yellow highlighter (I found the big ones are easiest to pop open... found a pack of 3 at the dollar store) and remove cylinder ink pad. Soak the ink pad in water for about an hour or until it loses it's color. To break them open just squeeze the end with a pair of scissors and the back will pop off. If you have a hard time getting them open just soak the whole highlighter in water, tip down. It will take a little while longer but will work just as well. You CAN dilute this quite a bit and it will still glow. We filled a decent size tub half way up with water only using one little yellow highlighter, and I'm sure we could have diluted it more. Off to the fun part! Shine your black light where you will be using your glow water and watch the magic happen. Here are a few activities that we have tried. Poring glow water down water wall. Awesome! Watching the water flow down. Just plain old glow water. YES, you may put your feet in it. Glow in the dark water beads. To make these just let your clear water beads soak in glow water. The green ice cubes are frozen glow water and the white/blue looking ones are frozen tonic water. I love your creative page. It has given me, and others a different view of learning. 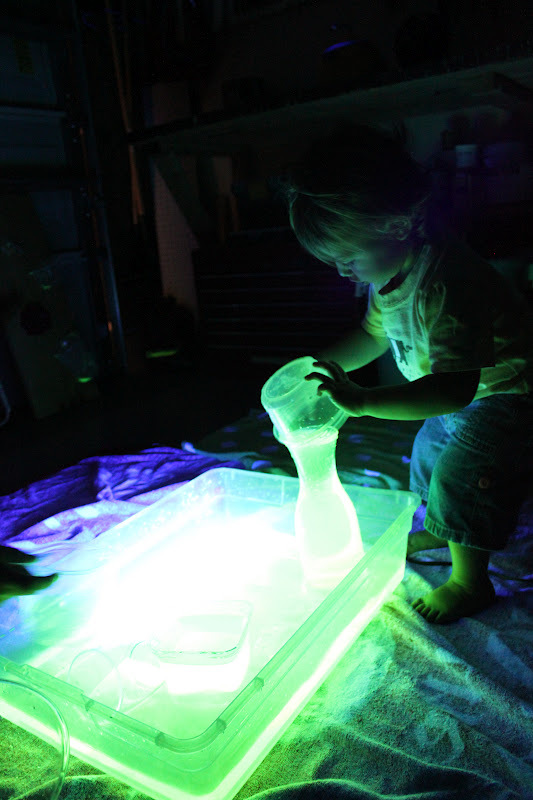 By using your shared ideas they are making children excited, and happy through play. :-)~Thanks so much for all you guys do! Did you ever complete your glow flowers experiment? I suspected it was something like the Steve Spangler Red Carnation experiment... was it?? Flowers did NOT work. Booooo! LOVE THIS!!! 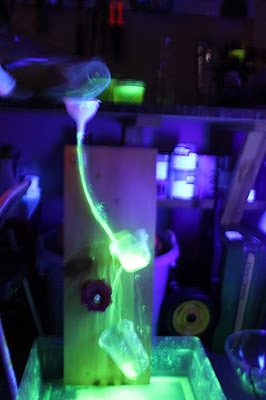 Do you already have a post that explains what you used for the black lights? Did you just replace the florescent bulbs with black light bulbs in your light box? How did u make the glow in the dark bubbles?? My kids LOVE bubbles!! I would think twice about this... what kind of chemicals are you dumping in the bathtub that your child is in??!? DO NOT break open a glow stick into it! A vial of glass separates the chemicals in the glowstick until you break it in order to activate it, pouring it out into a bath would literally be bathing your child in particles of glass. I may be crazily not over reacting, but,I am pretty sure they are talking about bubbles you blow in the air, ladies. @SHARON YOU CAN SEE THE LINK FOR THE BLACK LIGHT WE PURCHASED IN THIS BLOG POST. IT WAS FROM AMAZON. @BOOGAFACE I PURCHASED THE GLOW BUBBLES FROM AMAZON. I TRIED TO MAKE MY OWN WITH THE GLOW WATER BUT THEY DIDN'T SEEM TO WORK SO WELL. your blog is great and me introducing this fun stuff to children in my center. :) keep up and more fun! thank you for sharing. i am so greatful to find something like this. I absolutely love your blog. It is wonderful and exciting. You have some fantastic ideas. I recently made a glow station for my daughter thanks to inspiration from you. My daughter absolutely loves it. I recently started a blog and shared my glow station in it. I gave you credit for the idea (since it was yours) but was wondering if you would tell me what you thought of it. Keep the great ideas coming. Love the blog! Do you know if a black light light bulb in a regular lamp would work too? We bought a blacklight light bulb at Wal-Mart and used it in our daughter's bedside lamp. It worked great! This is totally awesome! Once I get my homeschool site back up and running properly, I'm definitely going to list it with all my other science links! Where do you get these ideas from? How dark does the room have to be for this to work? 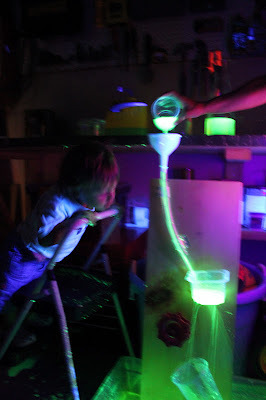 Would love to use these activities at the preschools where I teach science....however it would not be possible to have total darkness in those rooms....LOVE YOUR SITE! Can you use any color highlighter? If you use orange will it be orange glow water/yellow is yellow glow water? Is it safe for skin? I thought I saw somewhere someone using this in bathwater. I love this!! My son is 22 months and I think would get a massive kick out of this! I really hope you ladies publish these ideas in a book or three. I would buy them quickly so I could thumb through them for inspiration! I would also like to know if it's safe on skin as well as if a child decides to put their hands in their mouths after touching all of this. Teach them to wash their hands. Will it stain my fountain if I put it in there? Being studying chemistry at college level I can assure you that you do NOT want these chemicals to get into your kids mouth and it can do very bad things to your skin. There are reasons why these chemicals glow in dark and why natural and healthy chemical don't. Just think about it. 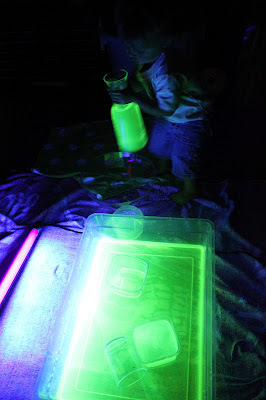 It's a great idea but I would look for other glowing things that have been tested, no just take any highlighter or worse, glow sticks and allow your kids to play in it. I think stores sell worse things that people eat on a daily basis. Yes, you probably shouldn't consume highlighters, no I don't think a little on a small section of your skin is going to kill you. Just wash it off as soon as you're done.